Big flavour. British meats. Foraging chefs. Wild ingredients. Experts at their own game, Gamekeeper serve up the best of British meat with ingenious little contemporary twists. 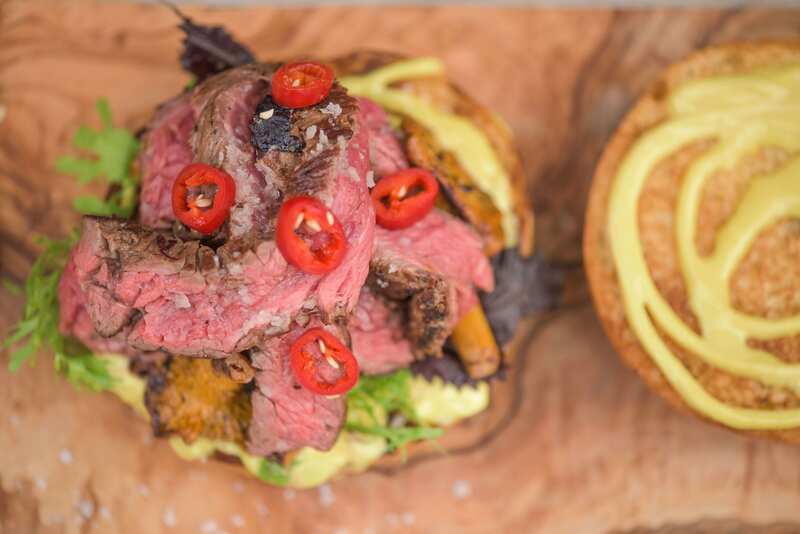 Jack and his team exclusively use the highest quality locally sourced ingredients to make succulent venison and deer burgers and halloumi and roasted veggie offerings. All of Gamekeeper’s melt in the mouth burgers and flatbreads are served from a hut made to look like a shooting log cabin… it doesn’t get more bloomin’ British than this! We love the Deerlicious Burger… 100% venison patty smothered with smoked cheddar, dijonnaise, sundried tomato chutney, peppery rocket and pickles, served in a fluffy steamed brioche bun. Book Gamekeeper for your next event! Mad about all things truffle? Then you must go out and get yourself one of these sumptuous truffley burgers. Despite using a high end ingredient, Truffle want to make this decadent flavour accessible to all and they’re the only street food caterer who specialises in it. Their hanger steak with truffle mashed potato and their been shin nuggets with truffle mayo are pretty incredible. They also whip up truffle scrambled eggs with smoked bacon and avocado in the mornings! 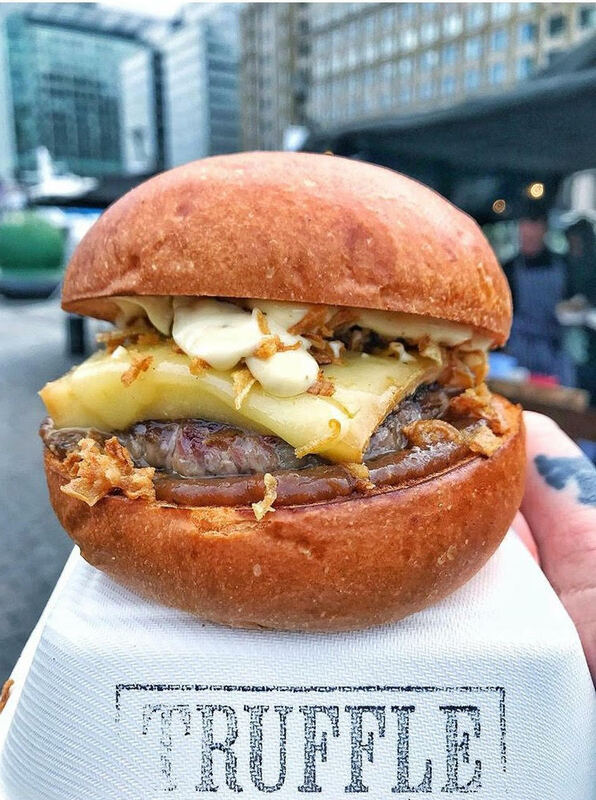 We love the Truffle Burger… a beef and smoked bacon patty with a fruity fig jam, crispy shallots and of course, truffle mayonnaise, in a brioche bun. Pioneering. Book Truffle for your next event! This adorable blue 1979 Renault Estafette takes to the road to bring people the best of British, inspired by wild ingredients and ethical farming. The Roadery exclusively uses locally sourced and foraged ingredients to create unique and ultimately mouthwatering burgers. This is real honest food with total respect for nature, what more could you want? 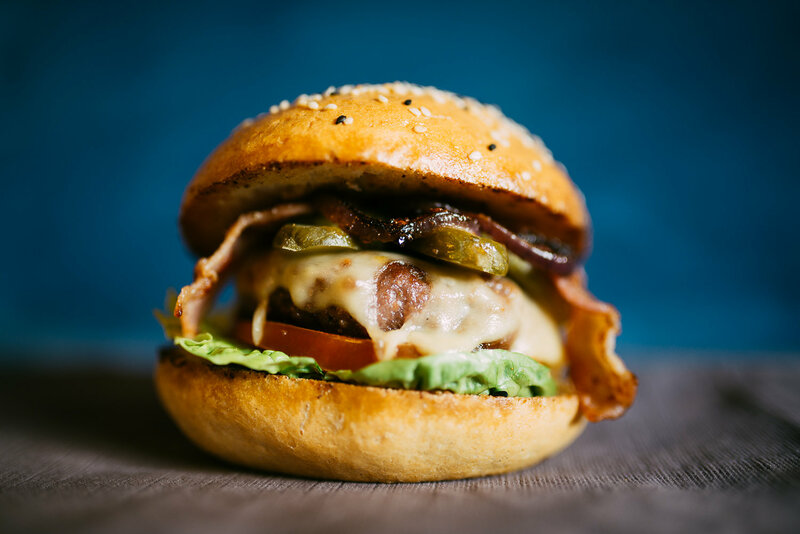 We love the Roadie Burger… a rich patty made from Dexter beef and marrow with Ogleshield cheese, Cotswold smoked bacon, wild garlic mayonnaise and The Roadery wild blackberry hot sauce, all nestled between a soft demi brioche bun. Book The Roadery for your next event! The classic tastes of the British seaside, with innovative and modern twists, Crabbieshack serve seafood burgers from their converted 1990s Leyland ambulance or their wooden crab shack. Expect seriously decadent flavours, award-winning food and good vibes all round. We love the Lobster Grilled Cheese Burger… This burger seriously packs a punch, crammed with lobster claws, a 28-day aged Dexter beef patty, red onion, 3 types of melted cheese, bacon, dill pickles, truffle mayonnaise and franks hot sauce, all in a brioche bun! Book Crabbieshack for your next event! 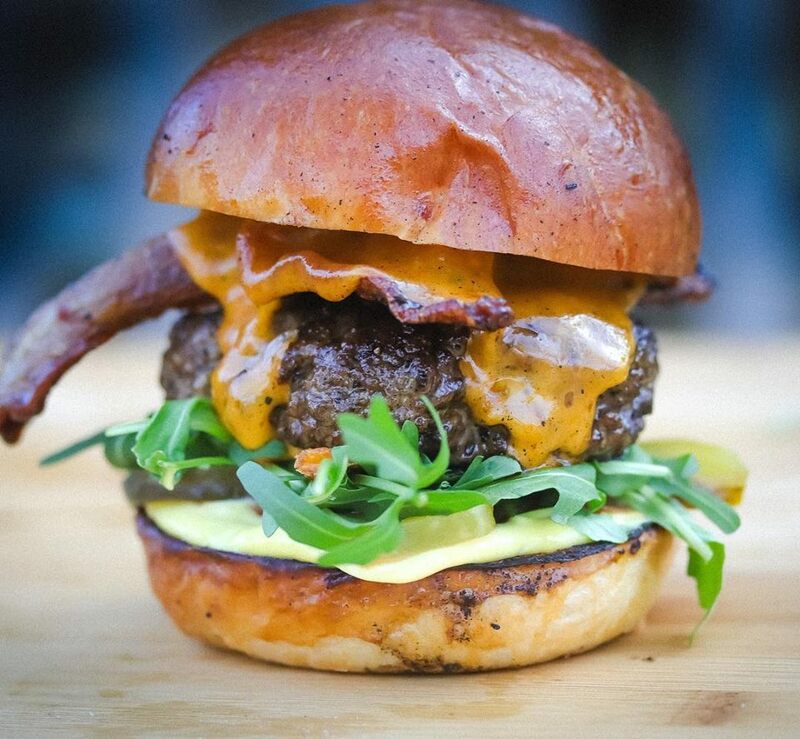 Passionate about wild foods, the team behind Wild & Rustic are inspired by the rural countryside when it comes to creating their delicious gourmet burgers and seasonal menus. These guys are all about big flavour and honest, sustainable food, letting their incredibly fresh meats do the talking. 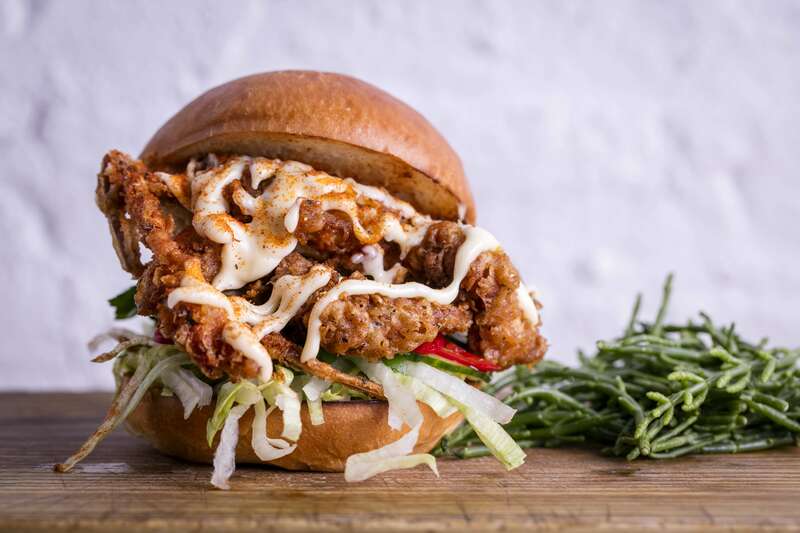 We love the Free-Ranger… Sous vide lemon and thyme crispy chicken thighs with peppery wild rocket, roasted confit garlic mayonnaise and aged parmesan, sandwiched between a sourdough bun… the chicken burger at its best! Book Wild & Rustic for your next event! Jess and Zoe cook up a storm in their 1970s caravan under a pink neon Trailer Trash light, making badass burgers that are simple but ever so effective! They can create bespoke burgers just for you but their classic Big, Bad Burger and Halloumi Burger are also total knockouts. We love the Jerk Chicken Burger… a British take on a Jamaican classic, succulent jerk chicken smothered in a lime, chilli and coriander mayonnaise. Book Trailer Trash for your next event! Ruddy delicious homemade British food using on the finest locally sourced ingredients, The Wandering Kitchen cook with game meats like wood pigeon, venison and wild boar! 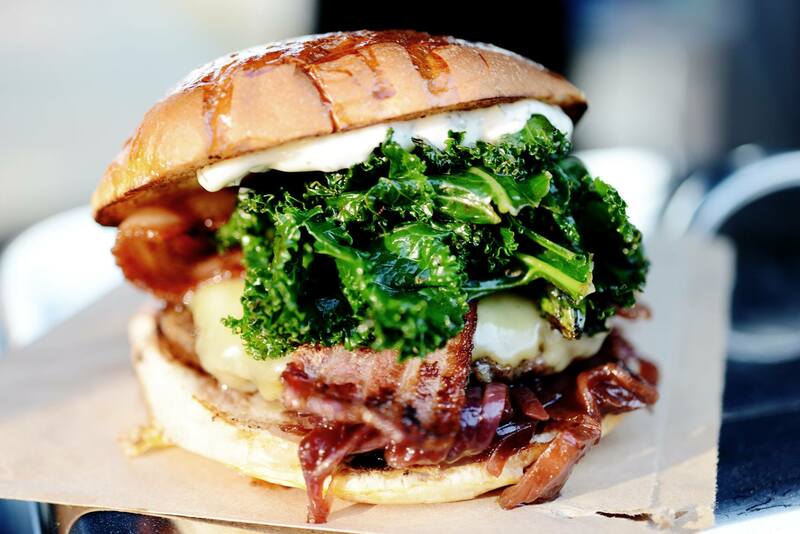 They have an awesome truck completely clad in wood, which looks fantastic at events and their inventive burgers are guaranteed to go down a treat. 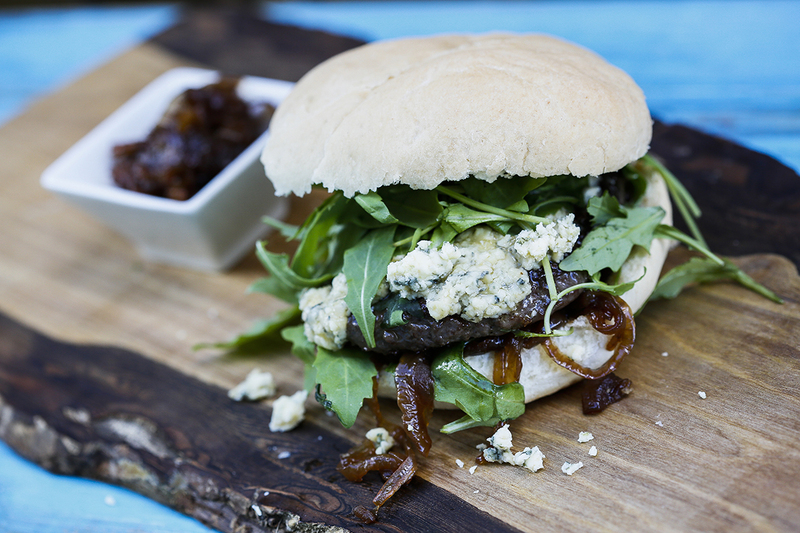 We love the Wild Boar Burger… a rustic bread roll stuffed with a wild boar patty, caramelised red onion chutney and cheddar or stilton cheese crumbled over the top. Book The Wandering Kitchen for your next event! These are just 7 of the great British caterers that you can book on Feast It and there are hundreds more handpicked street food traders and pop-up bars for to pick from, from Singaporean tacos to bespoke gin fizz! Whether you're looking for food and drink for a rustic wedding, an elegant 50th birthday party or a rooftop corporate event, we've got the perfect caterers for you.